When Phil states, “If you want to fix something, you need to take everything about it apart. To figure out what’s important,” it should be understood as a guiding spirit to analyze Demolition as its meaning is buried in its detail. And now finally more people get a chance to appreciate Jean-Marc Vallée's newest masterpiece, Demolition. For my most recent review of it, check out the latest issue of Little White Lies. 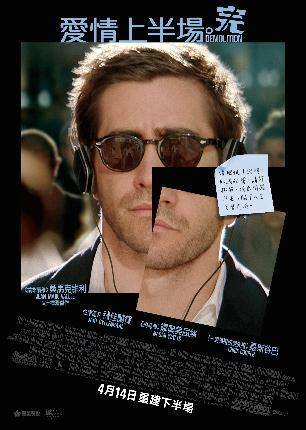 It'll be playing at the Varsity and Cineplex Yonge-Dundas starting today Friday, April 8th. 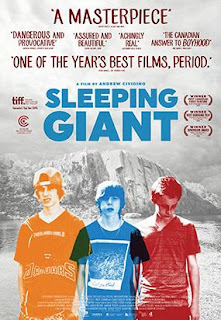 Andrew Cividino's dynamic coming of age story Sleeping Giant, about three boys experiencing the pleasures of a restless summer along with the anxieties that inevitably arises, finally starts its theatrical release today, Friday, April 8th at the Varsity. Check it out if can! 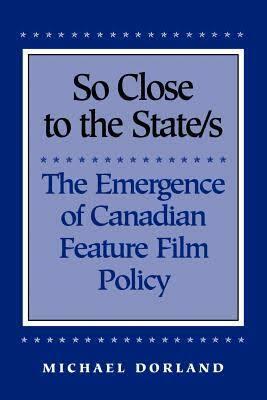 David Davidson: Can you tell me how your book So Close to the State/s: The Emergence of Canadian Feature Film Policy (UTP, 1998) came to be? What sparked this research? What methodology problems did you have to solve? Michael Dorland: I was working as a reporter/editor for Cinema Canada magazine, once upon a time the voice of a nationalist Canadian and Quebec cinema. 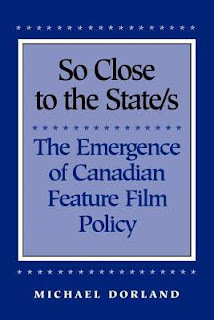 In the time I was there, roughly from 1980-1985, the major federal policy change regarding film was a shift away from previous attempts to foster feature films (initially using a small $10m production and later through tax-shelter) with a turn to fostering TV production (the Telefilm Television Fund). After all, the broadcasting system was Canadian-owned whereas the cinema distribution system was and remains mainly US-owned. Also working as a reporter, one tends after a while to see the same things come around, and around, and this was systemically the case, whether in attempting to “foster” Canadian film development, or through the CRTC to “foster” Canadian content in broadcasting and music. What I wanted to figure out was why all this endless and seemingly unaware repetition. So in 1987, I got the opportunity to start a Phd in Communication at Concordia. The book is drawn from my dissertation. The principal methodological problem I faced was finding an operationalizable concept that captured the role of the government/state in film production. Marxist methods had clear limitations in that it was never clear which “bourgeoisie” the Canadian state ‘worked’ for. Cultural studies in Canada at the time, and perhaps still, did not have a clear method other than the subcultural. What worked in the end, and it was something of a fluke, the result of much reading of Foucault, was the concept of governmentality, which seemed ideally suited for the Canadian context; that is, of an overriding state interest in the orientation of both economy and society without being clearly a class interest, but a muddle of some nationalist ideas mixed in with state interests as an end in itself. The other problem, with which I began first, was access to information held in government bureaucracies. DD: How was its research process? The references from government documents, archival sources, unpublished material, personal letters and notes, an extensive referencing of newspaper and Canadian film journals and periodicals is quite erudite in its depth and range. How did you know what to look for, and were they easy to access? MD: Bureaucracy is many-headed, so if you can access one major bureaucracy, there is a strong likelihood of accessing them all through duplication. My way in was through the National Film Board. I knew the head archivist at the time; I had interviewed him for the magazine; and he basically explained the structure of the Board’s archiving system and I was off and running. This was still before computerization, and the ensuing nightmare of computer dumps that fortunately I did not have to deal with. So using the Board’s archives, from minutes of the Board of the Board and all of the attached documentation that covered most of the bureaucracy involved in the film policy process, to production files for given films as well as television, really opened up the whole field for me. Especially the conviction at the time, early 1950s, that the Board thought it would be responsible for television in Canada. This was hugely important, especially when it came to untangling the symbiotic relationship between film and TV in the Canadian context of the ‘50s and ‘60s. How to know what to access and whether it was easy is basically hit and miss. You follow a thread and see where it takes you. If it doesn’t take you anywhere, you follow another thread. Easy? Never, and I don’t think the dissertation and book would have been doable without the NFB lifeline into the state bureaucracy. DD: How was the book received? Did it have any effect, that you are aware of, on the domains of its dissertation such as Canadian filmmaking, government policy, or Canadian film scholarship? MD: The book itself was quite well received in the small universe of Canadian film scholarship, and to some extent also in Australian film scholarship. ‘Well received’ is of course a relative notion. A few people noticed and said nice things. Outside of these small scholarly worlds, I don’t think the book had any impact at all. DD: The book seems to answer the specific question of is there a ‘Canadian cinema’ by closely examining the formation of its industry in the 50s and 60s through the role of governmentality and its mediation between public institutions and private interests. It both brings together many dilemmas and problems still facing Canadian cinema today as well as the ground-work that contributed to making Canada a world-class country for industrial filmmaking (four of last years Best Picture Oscar contenders were Canadian co-productions, for example). How do you view the arguments from the book from the vantage point of 2016? MD: I am not sure the book attempts to answer the specific question of “is there a Canadian cinema” for the reasons that there isn’t a Canadian cinema, but rather many Canadian cinemas, some ceaselessly rediscovered, some endlessly hoped for, and some that couldn’t care less as long as there is “product,” and if Canadians are involved that’s a plus. Canadian cinema has been all of these things at various times. What was the case in the late 1960s was that there were a handful of filmmakers, usually of shorts and documentaries, and some of these wanted to make feature films. The government also wanted there to be more made-in-Canada feature films, without getting too picky about the phrase made-in-Canada. The government in particular wanted a feature film industry with only the vaguest idea of what this might actually mean or entail. With the creation in 1968 of the first feature film fund of $10m, the head of the fund called up his pals in Hollywood and said, hey, we’ve got $10m to play with, wanna play? And of course they did. That was sixty years ago and in that time something like a film and television industry has been created, with all this implies in terms of infrastructure, labs, equipment, lighting, computerization, etc. Parts of that industry, in Vancouver and Toronto, sometimes in Alberta, (and in Montreal, though Quebec is always somewhat different), are capable of producing product that can sell to Hollywood or elsewhere, and to television all over the world, and in pretty much any genre imaginable. But that industry is still not “Canadian cinema”, a creature that remains as elusive as ever. Again, what the Canadian government of the 1960s wanted was a film industry. Eventually, it got one, after a fashion. DD: What contemporary issues do you feel deserve more attention in the discussion of Canadian cinema today and its relation to government legislation and the private industry? And can you envisage any challenges in realizing it? (The conclusion on Policy Knowledge versus Academic Knowledge seems quite relevant in regards to this). MD: As you say, there is Academic Knowledge and Policy Knowledge and they rarely meet each other. There is a large Policy apparatus in Canada very little studied by academics, which is unfortunate, but the ends are completely different. To the extent that Academic knowledge is about a broader understanding of context, and Policy knowledge is (not that it should be) about selling to bureaucrats something they want to hear and will pay for, there is still a very long way to go. Since the publication of So Close to the State/s my sense of the direction of academic work is that it is more regionally focused and more firmly set in the realm of production studies. As for Policy knowledge, that is a field entirely up for grabs by interested academics. MD: You didn’t ask me this, but the title of the book is a play on the Mexican proverb, “So Close to the United States, So Far From God.” You can draw your own conclusions.